Jeremy Corbyn challenged Theresa May to lead or leave amid Tory worries over the Government's flagship welfare reforms. The Labour leader criticised a "string of failures" from the Government, focusing on Universal Credit and calling for the Prime Minister to "wake up to reality" and halt its roll-out. Tory MP Heidi Allen (South Cambridgeshire) also expressed concerns over the welfare programme, adding there are "many of us" on the Government's benches who believe changes are needed. Mrs May agreed to have a meeting with Ms Allen. Universal Credit involves rolling six means-tested working-age benefits into one payment. 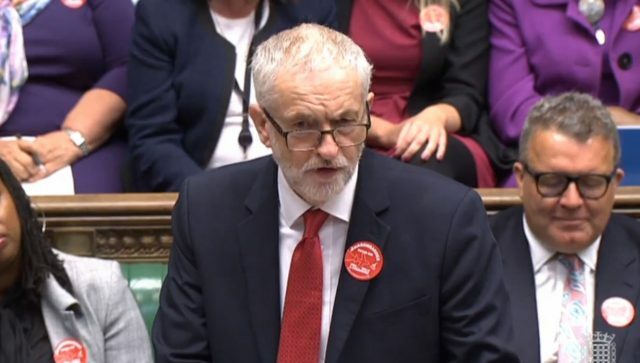 Mr Corbyn used Prime Minister's Questions to repeatedly criticise the process and asked Mrs May to "show some humanity" by making the UC helpline free - telling MPs it costs people 55p a minute. He also said to the PM: "Sadly Universal Credit is only one of a string of failures of this Government. "Everywhere you look it's a Government in chaos. On the most important issues facing this country it's a shambles. "Brexit negotiations - made no progress. Bombardier and other workers facing redundancy. Most working people worse off. Young people pushed into record levels of debt. A million elderly people not getting essential care. Our NHS at breaking point. "This Government is more interested in fighting amongst themselves than in solving these problems." After Tory and Labour MPs heckled each other, Mr Corbyn added: "Isn't it the case that if a Prime Minister can't lead she should leave?" Mrs May defended the Government's record on the deficit, jobs, schools and the NHS before criticising Labour's housing policies trailed at its conference last month. She added: "The Equality and Human Rights Commission said Labour needs to establish it is not a racist party and the Labour leader of Brighton Council threatened to ban Labour conferences because of freely expressed anti-Semitism. "And that was all before the shadow chancellor admitted a Labour government would bring a run on the pound - and ordinary working people would pay the price." Ms Allen was cheered by some Labour MPs as she said she would ask Mrs May about UC, but noted: "Perhaps the difference on this side of the House and that side of the House is we believe in the transformative properties of it and we want it to work, and work it will, but we have to get it right. "I thank (Work and Pensions Secretary David Gauke) on Monday for promising to advertise more widely that advances will be available to claimants. "But there are many of us on this side of the House that feel more people taking those advances must surely mean the inbuilt six-week wait just doesn't work." She asked Mrs May to meet her so she could explain why reducing the six-week wait "will do a better job of supporting those just-about-managing families who are struggling to make ends meet and have no savings to cover them over that period". The PM, in her reply, said the Department for Work and Pensions is continuing to look at the performance and operation of UC. She added: "I'm happy to meet with you to look at this issue. "You've mentioned the advance payments - of course, as you say, it's important those who need those advance payments are aware of that and that's why it's not just about advertising but actually making sure Jobcentre staff are trained and they're being retrained to ensure they're aware of what they can do to help people." Mrs May said advance payments can be with people within five days or on the same day in an emergency. Earlier, Mr Corbyn, when highlighting concerns linked to UC, told MPs: "Can't the Prime Minister and the DWP wake up to reality and halt this process?" Mrs May defended the changes and said the Government had been "listening to the concerns raised", adding: "Changes have been made, performance has increased - for example, at the beginning of this year only 55% of people were getting their first payment on time, that is over 80%. "Of course there is more for us to do and that's what (Mr Gauke) and the Department for Work and Pensions continue to monitor this and continue to ensure the performance increases." The DWP said UC telephone calls cost up to 9p from a landline and between 3p to 55p from a mobile, which is dependent on person's mobile package. Mrs May later told the Commons: "The Leader of the Opposition asked me what planet I was on earlier. Well, we all know what planet he and his shadow chancellor are on - it's Planet Venezuela."